When you work with an experienced locksmith, you have many options for securing your home. Two options are rekeying your home and changing the locks. As your local locksmith for The Woodlands and Spring, we are often asked to change the locks of a home or business. Though changing the locks is a viable option, often times rekeying is better for many of our client’s needs. Though these many sound like the same thing, they are actually very different. In Woodlands and Spring, Texas our locksmiths have the opportunity to do both; let us explain the difference. Many locks have the ability to be changed by a locksmith so that they can accommodate a variety of keys; once your lock is rekeyed, the old key will no longer function in the lock. Rekeying a lock can be less expensive and destructive to the door or structure in which the lock would be replaced. So how does this work? Within a lock, there are parts called “tumblers” or “key pins.” These tumblers can be replaced by a locksmith so, essentially, you have a new lock without having to replace the entire lock device. Replacing the key pins does not compromise the reliability of the lock; the only aspect of rekeying a lock that is important is the number of key pins that are replaced. The locksmith must replace at least five of the old pins with five new pins. If you desire higher security, mention it to your locksmith, and they will replace more of the key pins. If, for some reason, you don’t have the original key, in many cases a locksmith can pick the original lock and still rekey your lock. So, why choose rekeying over changing your locks? First of all, rekeying is cheaper. Because the tumblers or key pins are less expensive than a new lock, rekeying is always the less expensive route to take and is just as effective and secure as replacing the lock. All locks have the rekeying option built into it when you buy it or have a locksmith install it. Ultimately, your local locksmith will be able to advise you as to when it is best to rekey or change your locks, but generally, rekeying is best in most circumstances. Rekeying can be a great option when you have multiple locks, but you want to use one key. Other reasons to choose rekeying are: if you like your locks, but you’ve moved and are unsure who has a key to your new home; if you’ve lost a copy of your key; if you want to keep another person from having access. Though rekeying can be the most viable option for your lock needs, changing the locks may be necessary. As stated above, there are circumstances when changing the locks is the best option. When you are remodeling or renovating and want a different style or color of lock is one of the times when changing the locks, is obviously the best option. Another reason for having your locksmith change the locks is if you wish to upgrade your security; if you want high-security locks or electronic locks, as assumed, you will need to change your locks. 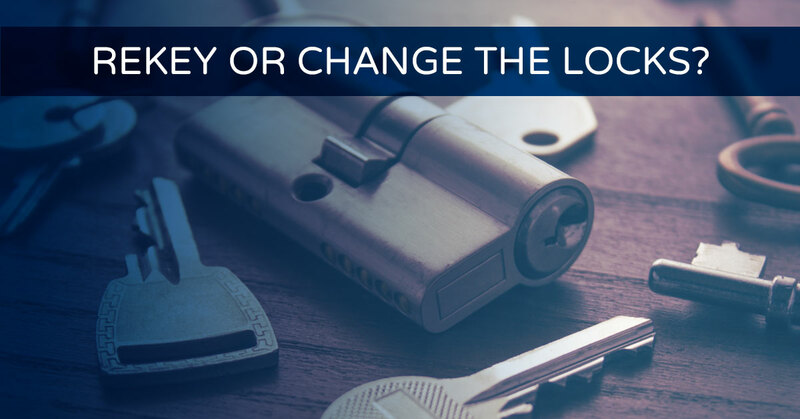 One other reason for changing the locks is if you have different brand locks throughout your home or business and want to have one key for all. Affordable Locksmith of Texas would love to help you when you are faced with the decision of rekeying or changing the locks. We hope that this blog has been helpful and would love to further advise you for your specific situation as to what option will suit your needs best. The locksmiths of Affordable Locksmith of Texas serve the Spring and The Woodland area with our mobile locksmith services. We are fully licensed and have been in the business for over a decade, providing a variety of excellent services including: residential and commercial locksmith services, auto locksmith and transponder key replacement and much more! We are a 24 hour locksmith offering emergency services: Call us and we will respond to your call within 15 minutes guaranteed.